I finally got on the street about 4:10 PM, after #31 came in with my cab. It was the first Monday of the month so everyone who gets paid monthly would have money and be out spending it. It was an overcast night, that had occasional sprinkles, requiring me to turn on the windshield wipers every couple of minutes. A little after 5:00 PM I got a call to Motel 6, room 299. 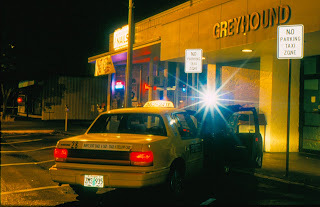 When I got there, I knocked on the door, and a man who looked like a street person, wearing a baseball cab, with long hair and a beard, dressed in ragged clothes answered the door, and told me that my passenger would be out in a minute. I sat in my cab waiting with the flashers on, until he came down, and got in. “Where are we heading?” I asked my fare, who looked to be around 60 years old with snow white shoulder length hair and a full beard. While we drove there, my passenger kept talking about how he was good for the fare, and wanted to have a few drinks. He handed me a $10.00 bill that he said was my tip, and when we got there he handed me a $20.00, to pay for the $12.60 fare. After I gave him his change, he asked for my card and I gave him one, with my number on it, for him to call when he was ready to go back to the motel. I got a couple of grocery runs from Walmart and Winco after that, and ended up at Greyhound around 7:00 PM, where I parked in the second taxi stand. There was another Yellow cab parked in the first stall, and I saw that it was #52. He started about 6 months ago and I talked to him a few times, but he seems strange. I can’t put my finger on it, but my gut churns every time that I talk to him. He always wears driving gloves with blue fingertips and a large blue patch on the palm. The first time that I met him he looked into my eyes, like he was trying to see something, and the take that he has on everything is like he just arrived here from another planet. I shut off my engine and took out the keys, as I got out of my cab and opened #52’s door. “Oh, it’s going great,” I answered. Remember what we were talking about last time?” I asked him. “I don’t know anything that isn’t common knowledge among googolplex sentient beings,” #52 answered. “If you mean a prime mover, or a first cause, the answer is yes,” he answered. “What about a personal God, who became man and died for our sins,” I said. “What is a sin?” he asked me, like he really didn’t know. “Why would a Mexican man have to die on a railroad warning sign for bad things that you do?” He asked me. “So the prime mover became part of its creation in order to save that creation from the error of its ways?” He asked. “Yeah, something like that,” I answered. “I take it this teaching is part of the religion that you call Christianity,” he said. “That path leads to the next phase,” which will be soon on this world. “What are you talking about?” I asked, as my mind grew confused while I started to get that churning feeling in my stomach. “That must be the guy that I drove from Motel 6 earlier,” I said, as I got out of #52’s cab, and got in my own. After I wrote down the call, I started my engine and began driving to Keizer. When I got to JC’s I went inside and found my passenger sitting at a table with a half finished mug of beer and a large white flat box with a pizza in it. “Your cab is here,” I told my passenger. I sat in my cab and waited until he came out and got in front with me. “Where too?” I asked. “I don’t want to go back to the motel yet, what bars are in that area?” He asked me. “There’s Players, Roccos, Canton Gardens and…” I was saying. “Ha, ha, ha, ha, ha, ha, ha, you’re funny, “he said.” Let’s go to Canton Gardens, and let your meter run.